PALO ALTO (May 17, 2011) – Independent children’s app developer Duck Duck Moose today is pleased to announce the launch of Word Wagon HD 1.0 for the iPad. The iPhone version of Word Wagon recently won the Children’s Technology Review Editor’s Choice Award. Word Wagon introduces letters, phonics, and spelling to children in Preschool, Kindergarten, and First Grade (ages 1-7). As children play with Mozzarella the Mouse and his friend Coco the bird, they can create words and earn colorful animated stickers and stars. The iPad version includes additional 7-letter words. “If you’re looking for a state-of-the-art school readiness app, this is a good choice for either home or classroom use,” says Warren Buckleitner of Children’s Technology Review. Mozzarella the Mouse and his friend Coco the bird play with children, while teaching them letter names, letter sounds, and words. As children spell words, they earn colorful animated stickers and stars. Mozzarella and Coco will also play hide and seek, dress up as a ghost, put on magic shoes, draw pictures, talk on the phone, and much more. Word Wagon includes more than 100 words (including Dolch sight words). Children can choose words from seven different categories: Animals, Food, Vehicles, Numbers and Colors, Around the House, Mozzarella and Coco’s Favorites, All Words. Sticker Rewards: Children can collect colorful stickers for each word in a sticker book. The stickers are interactive and include animations and sound effects. Stars and Constellations: Children can earn stars to make different constellations, which are shaped like animals. Mozzarella the mouse will dress up as an astronaut and float in space! The music arranged and recorded especially for this app is performed by cello and violin. Word Wagon HD 1.0 is $1.99 USD (or equivalent amount in other currencies) and available worldwide exclusively through the App Store in the Education category. 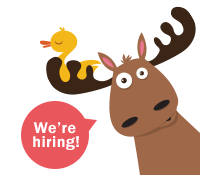 Duck Duck Moose is an award-winning creator of educational children’s applications. It was founded in 2008 by three friends who are parents themselves, and share a passion for children, music, education, design, and play. Duck Duck Moose’s top-selling apps include: Wheels on the Bus, Old MacDonald, Itsy Bitsy Spider, Fish School, Baa Baa Black Sheep and Park Math. Wheels on the Bus won the KAPi Award for “Best Children’s App” at the 2010 International CES and was featured as one of The New York Times’ “Best iPhone Apps for Kids.” Park Math won the “2010 Best Kids’ iPhone/iPod App of the Year Award” from iLounge. All six of the company’s products have won the Children’s Technology Review Editor’s Choice Award for Excellence in Design, and three have won the Parents’ Choice Gold Award. Copyright (C) 2008-2011 Duck Duck Moose. All Rights Reserved. Apple, the Apple logo, iPhone, iPod and iPad are registered trademarks of Apple Inc. in the U.S. and/or other countries.